You must be a member of the Milan Sustainability Group to attend this activity. Would you like to join this group? Can you build a bamboo bicycle? Do you know that you can make music with a recycled vacuum cleaner? Do you know that even a vintage car can be driven by an electric motor? Do you know that there are flower vases that monitor the quality of the air? Do you think a fabric made from citrus fruit scraps smells like orange? Come and discover all this! We are waiting for you with debates, music and a special story by Jacopo Fo. 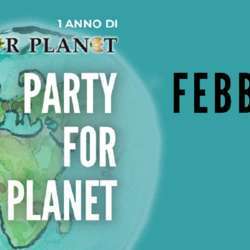 There will be under the same roof guests, supporters, readers and all those who care about the issues to which the magazine is dedicated: environment, sustainability, correct relationship between individuals and the planet. The atmosphere will be that of a birthday party, but we will cut out spaces to discuss, together with experts and institutions, which solutions and behaviors will allow us to change our cities to make them smarter, less polluted and more citizen-friendly. "What air it pulls". A personal and unpublished story by Jacopo Fo. Following a special interpretation of the actress Lucia Vasini, who will bring on stage a preview of a piece of the show "Mistero Buffo - Parti Femminili". "What air do you pull?" ▪ Valerio Rossi Albertini, CNR physicist and Professor of Science Disclosure at the Second University of Rome, who will clarify the idea of what the fine particles are. ▪ Anna Gerometta, president of Cittadini per l'Onlus Association, who repeatedly denounced Milanese issues related to air quality. ▪ Paolo Barbato, Carlo Alberto Gaetaniello and Andrea Torrone, founders of Wiseair, who will reveal the secrets of their 'capillary and shared' system for the detection of pollutants through the use of a smart plant pot connected to an Internet network. The faces that People for Planet met in its first year online are told in the formula "TED talks": they will have a space of time during which they can present themselves and their activities. To end the evening, on the stage will rise the Campania group Capone & BungtBangt with self-made musical instruments joining parts of recycled objects. The band was born following the idea of creative recycling, accompanied by a visceral love for music and nature. You will listen (and you will see!) how the magic of music is born from the hands of these artists and how valuable objects can become splendid musical instruments of inestimable value and with a unique sound. Event under the patronage of the City of Milan. Feel free to come for all the parts or to come later for the debates or the live music show.